Apartments Above the Metro Line. A lot of what is built in LA is heralded by boosters as being the start of some new epic in this city: Dorothy Chandler Pavillon, Disney Hall, Citywalk, Getty, Disneyland. But do these mega-projects contribute to our daily life? 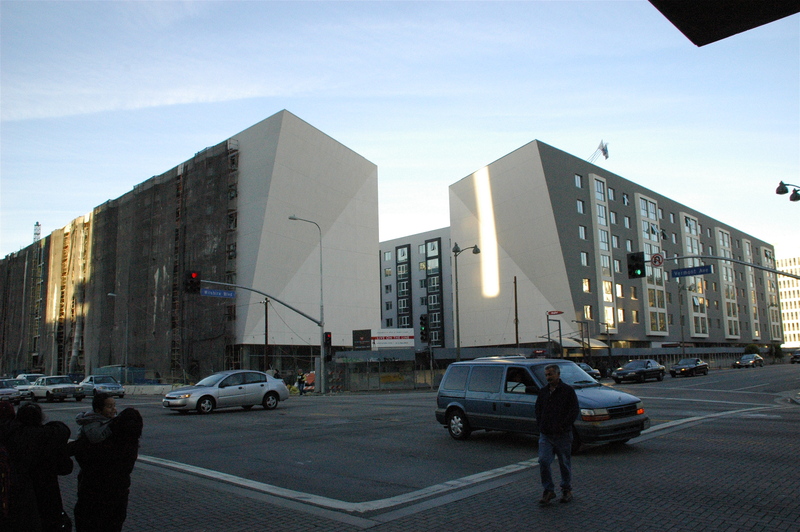 This development, at the corner of Vermont and Wilshire, could be just as important at the construction of the “Miracle Mile” shopping area in the 1920s which drew shoppers from downtown to “suburbia”. Because here is proof, built in steel and concrete, that Los Angeles is shedding its old skin of cars, cars, cars and allowing a new way of life to emerge based on walking and public transportation and urban street life and amenities. The brilliant truth about LA, one that runs counter to its stereotype, is that it is indeed amorphous in the way it evolves. It is not a stagnant city, it is open and enlightened. Sometimes, not always. We might live stylishly, but some of us also die senselessly. This urbane design is a hopeful development. I agree with your points. I think the building of so many parking spaces is encouraging the wrong uses of our transport systems, but it may be a revenue related issue for the developer. The number of units is still too low. So many building in Los Angeles are not tall enough, despite the enormous need for more residential housing. 700 spaces for 380 units. This is the intersection of the city’s two busiest and most frequent bus lines and its only two subway lines. It’s one of the most traveled intersections in the county, and its the most dense area in the country west of Manhattan. By having all those spaces you’re encouraging people to drive to the station/retail locations instead of walk, bike or take the bus – adding cars to streets already operating way above designed capacity. It exacerbates the traffic problem; it doesn’t solve it. I’d bet the parking requirement definitely contributed to its low number of units (380), but so too may be the fact that its on top of a subway station. Although I think there are plenty of subway stations below skyscrapers. Basically, I’d like to see us efficiently use the final parcels of land in this city – especially those served with such excellent transit service as this. A 15-20 story building with 1000-1200 units (some even without parking spaces and thereby at reduced cost) would have done much more to get people out of their cars and help solve our housing crisis. I’ve got hope for the gas station right across the street. I agree that the seeming absence of balconies is strange. But I’m also one who has never thought that they were very often well used. You can drive all over LA and see them used for bicycle storage, laundry drying, or with rusted fitness equipment on them. The balconies at this busy and air polluted junction would be soot covered and noisy places to “entertain” and not suitable to read a book or commune with nature. I’m a little concerned that they seem to lack balconies and patios. Where is the private outdoor living area? Is there retail on the ground floor? ← And They Deserve Their Own State?